As well as providing optimal shade protection for your home, a Brax Folding Arm Awning can provide a distinctive and functional extension to your outdoor living area. We have a game changer in our home and its our fab new retractable awning. This little beauty has changed the way we use our outdoor space! It allows us so much more time outdoors in our courtyard especially during the middle of the day when it was once too hot. The shade it creates also keeps the inside of our home so much cooler by shielding the windows from being hit by direct sunlight. The high quality remote controlled automation makes for super easy functionality, all whilst looking super sleek and chic! We could not be anymore thrilled!!! Designed for our Australian climate, all Folding Arm Awnings manufactured and professionally installed by Brax are built to last. Gain control over the amount of sun entering your home – during the summer extend the shade to keep your home cool and provide a shady outdoor area, then in winter they can be retracted to let in the light and warmth. The cantilever design, supported by strong spring tensioned arms, means that when extended, no other support is necessary giving you a fully useable area. A user-adjustable variable pitch means you can raise or lower the awning to suit the sun conditions at different times of the year. Our installers will set the recommended pitch at the time of installation, but you also have the ability to adjust this as required. 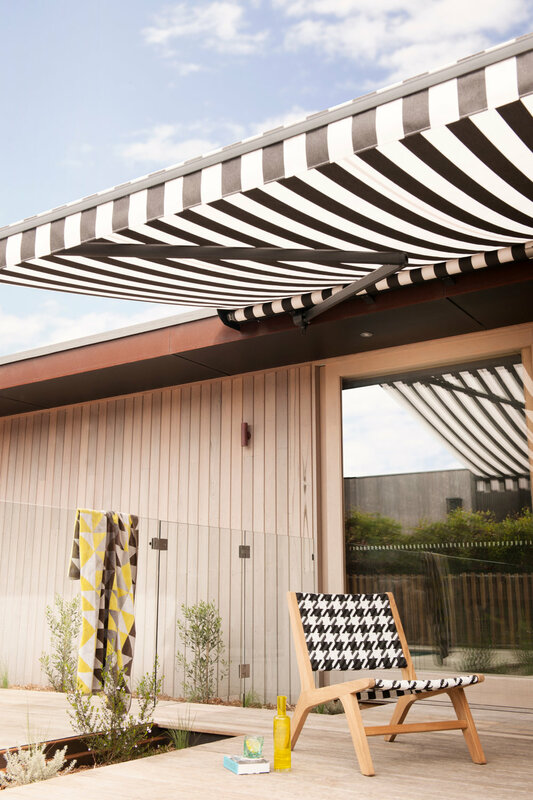 Manufactured locally in our South Geelong factory, our Folding Arm Awnings are made from the highest quality powder coated components, available in three standard colours – white, silver & black. We invite you to visit our showroom to view our full sized displays, or call about our free in-home consultation where one of our experienced consultants can advise on the best option to suit your needs. As a standard inclusion with all ‘Brax’ motorised FAAs, a Somfy® Eolis 3D motion sensor will be installed. This safety device attaches to the front of the awning and is designed to retract the awning if affected by movement. For obvious reasons we do not recommend use of the awning in windy conditions, as even with the sensor the awning will take time to retract, risking possible damage to both it and the structure it is attached to. We recommend around 6m as a single unit. Our awnings available in widths up to 11m as a joined unit and larger size awnings are available, but we do recommend installation of multiple smaller awnings for maximum user benefits. Available in 1250mm, 1750mm, 2100mm, 2600mm, 3100mm and 3600mm. Commercial style awnings can project further. Please remember that you can stop the awning at any point, so that it doesn’t always need to be fully extended. We recommend the use of 100% solution dyed acrylic, specifically designed for outdoor use. These high performance fabrics, manufactured in Europe, are designed to provide shade, reduce glare and UV protection. These fabrics have the Oeko-Tex® 100 certification, which means they are tested and approved, and do not contain any harmful chemicals – safer for you and our environment. Available in a large range of plains and fashionable stripes, and guaranteed for 5-8 years. It is critical that your awning is professionally installed, ensuring solid fixing, as when fully extended the awning can be affected by uplift or weight bearing down – if not correctly installed you risk structural damage to buildings. We have specially designed installation brackets available to suit most types of installation. Our trained consultants will advise on the best choice for your situation, and may also recommend a site inspection by one of our trained installers prior to manufacture. Installation brackets may incur additional charges but are an investment in the strength, longevity and security of your awning. We recommend motorising your Folding Arm Awning, as this is the user-friendliest method and ensures you get maximum use and benefits from your investment. Brax are proud to be part of the Somfy® Expert alliance, as Somfy® are market leaders in home automation and implementation of new technology. French designed and manufactured all Somfy® products are backed by a 5-year guarantee. Manual (crank) operation is available as an alternative.